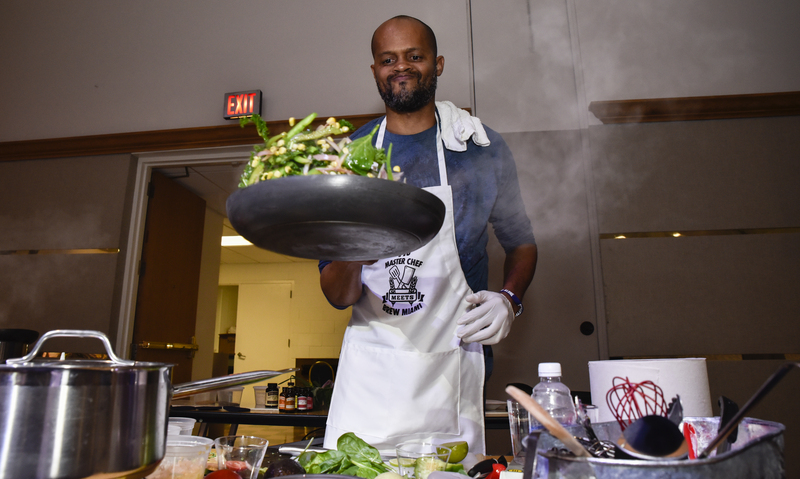 Andrew Rolle, assistant director at the Wolfe University Center, creates a veggie blend during last year’s competition. Do you think you are FIU’s best chef? Sign up for the second annual Taste of FIU Cook Off Competition, which will be held in collaboration with the university’s annual United Way Auction Dec. 9. The competition is open to faculty, staff, students and alumni. This year, 15 contestants will be chosen to compete in the Graham Center Ballrooms for the title of FIU’s best chef. They will compete in three elimination rounds, where participants will have an opportunity to showcase their cooking techniques, creativity and inspirations. To qualify, you must be an amateur cook (i.e. not have attended culinary school or have previously worked as a professional chef) and be at least 21 years old, since the rounds may include beer and/or spirits as an ingredient. Every contestant will be asked to secure at least $350 from donations or sponsorships with proceeds to benefit the FIU United Way Campaign. The deadline to apply for the competition is next Wednesday, Sept. 14, at 5 p.m. and the deadline to submit donations and sponsorships to GC 1210 is Nov. 28 at 5 p.m.
To apply for the Taste of FIU Cook Off Competition, click here.